After I posted the Marguerite de Bressieux entry on Twitter, it kind of exploded. I’d posted up all the info I had about it, with a big, “I don’t know if this is true” at the end. While the story was fishy — the lack of contemporary corroboration and the direct quotations raise an eyebrow — I tended to believe it was true. This was largely due to several 19th century French historians writing about her, concrete evidence that her father Georges existed, and the specificity of exact dates and names attached. I figured there were likely older documents I didn’t have access to, which could prove or disprove it. Basically, I’d done as much as I could. Thankfully, a couple historians chimed in with some additional info. First came Roger McCarthy, who thought this sounded like a pseudohistory and attacked the idea that 19th century historians could get this right. 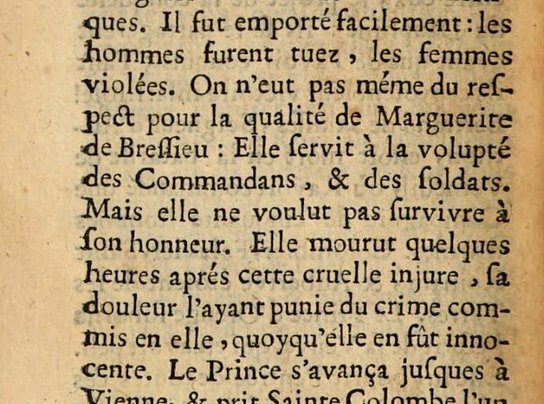 He linked to genealogy websites that indicated that the Bressieux line had died out before Marguerite was born, although this also wasn’t exactly conclusive. In this version, Marguerite died shortly after the assault – whether by her own hands or from her injuries is left vague. Seale points out that the next author to pop up was Alfred de Bougy, a writer of historical fiction. I didn’t go by Bougy’s account, but it seems likely that Tranchant and Ladimir did in 1866. That seems about as much info as we’ll get on this one! I’ve updated the entry to reflect that it was a legend, and will be doing similar to the pictures inside of it once I get a second.